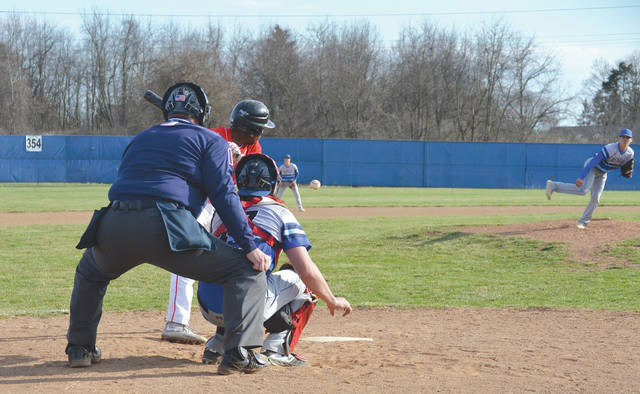 Buccaneers senior pitcher Blayne Dudley limited Huber Heights Wayne to five hits in seven innings of work, April 3, in an eighth-inning 6-4 loss at Xenia High School. Xenia’s Kyle Lane (5) slides home safely on a wild pitch to score the winning run in to finish an abbreviated first game against Wayne, a 10-9 Buccaneers win, April 3 at Xenia High School. Wayne’s senior shortstop Jordan Long lays off an inside pitch in the second inning of Wednesday’s second game between the Warriors and host Xenia High. Wayne won the second extra-inning contest, 6-4, for the team’s first win of the season. 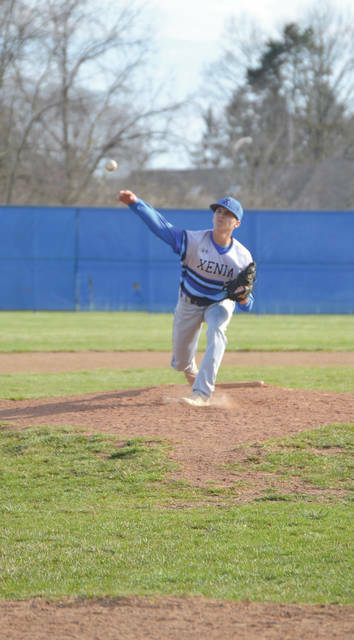 XENIA — Visiting Wayne High and host Xenia battled to a pair of eighth inning outcomes on April 3 … well sorta. First, the two Greater Western Ohio Conference teams finished a March 28 game that had ended under darkness with the score all knotted up at 9-all. Xenia won that contest when Kyle Lane raced in from third base and slide safely across home plate on a wild pitch in the Buccaneers’ bottom half of the eighth. 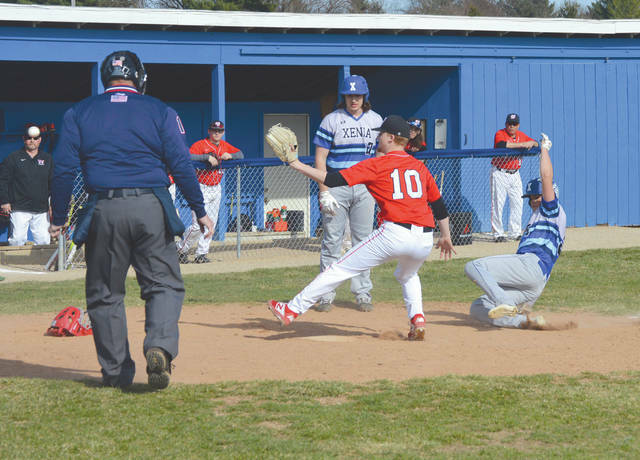 It then looked as if the second game would wind up being ‘darked out’ as well, but the visiting Warriors scored three runs in their top half of the eighth, then fended off a Xenia rally, to win the nightcap, 6-4. “I was getting ready to go over and talk with Barry (Xenia coach Barry Claus) and see whether we was gonna have to go home again to make this game up as well. I was gonna see whether he’d want to schedule another doubleheader again,” Wayne coach Joe Yount said. “I’m happy for our players. They got off the losing snide. Xenia fell to 6-1 overall, and remains 2-0 in the GWOC South. They play Tippecanoe for a 5 p.m. Thursday April 4 game up in Tipp City next. Aside from the split with Xenia, Wayne (1-4) had been shutout on the road in Troy 13-0, then they lost a home-and-home series with Centerville by scores of 11-0 and 20-0. The Warriors head to Toadvine Field in Miamisburg to take on the Vikings at 5 p.m. on Thursday, April 4 for their next game. Xenia’s Claus gave his players a stern post-game speech after his team stranded 18 players on the bases in the Game 2 loss. Adkins went 3-for-5 in Game 2 with a double and two runs batted in. Sophomore lead-off batter Aydan Evans had two hits, two stolen bases, scored twice, drew a walk, and was intentionally walked two other times in the extra-inning loss. Senior Warren Mahar had a pair of singles and drove in two runs as well.